Big cellular brands never stop discovering new technology and new features that have not been previously observed in any gadget, smartphone or devices. Therefore they hire up a bigger team who work day and night to bring quality and a whole new feel into the compositions. Apple and Samsung have always been into cut neck competition. These are the consistent tech brands you can rely on blindly. Every year we happen to see new and amazing handsets with some surprisingly new and awesome features that one cannot imagine. They come up in different shapes and sizes as well as in different colors to entertain all women and men equally. As the speculations of iPhone 7 were spreading out, finally the launch of next generation Apple iPhone 7 and iPhone 7 plus, in San Francisco, refuted the rumors of many and came out with features that are beyond ones expectations. It is artistically a little similar to iPhone 6s and 6s plus however comes with a complete different raft. Black color lovers will be glad knowing that iPhone 7 comes in jet black and black to give an awesome experience to one’s aesthetics. 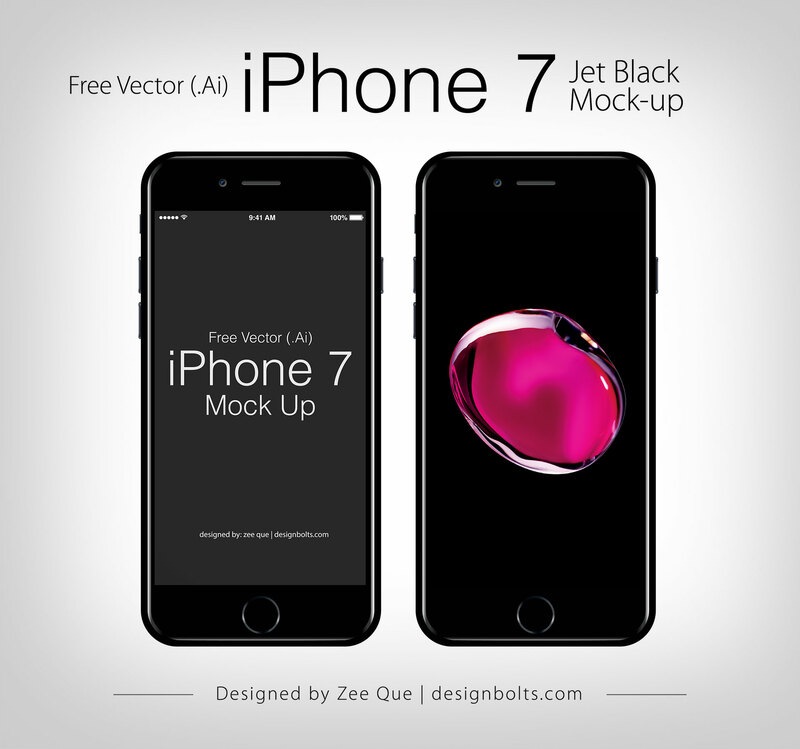 Here I am presenting before you free vector Apple iPhone 7 mockup that you can use in your projects. Insert in the design element and it is ready to be showcased freely. iPhone 7 is diverse and attractive in many ways, especially over the internet we have seen the how Air pods have created a stir in the masses– these air pods being wirelessly miraculous give a next level experience to its users. iPhone 7 comes with water resistant technology, more refined camera experience, faster processor, improved battery life, pressure sensitive home button, and a starting size of 32GB. I hope the new iPhone 7 gives us a power packed experience, so what are you waiting for, go and get one booked for yourself. Stay hooked to the blog for latest design trends and happenings across the globe, we aim to please. Here we go!